BRIsat will provide enhanced secure banking communications for more than 10,600 operational branches, as well as to some 237,000 electronic channel outlets and nearly 53 million customers across the Indonesian archipelago. 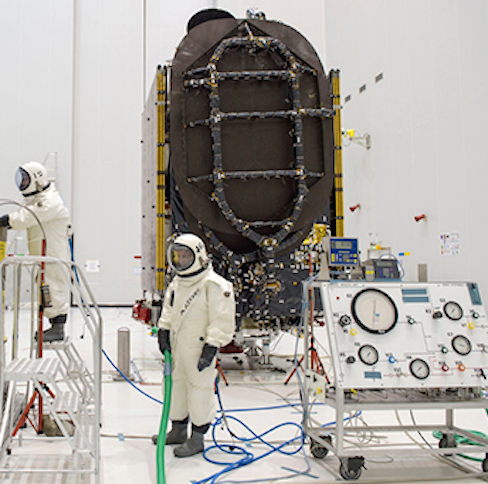 BRIsat is “topped off” in the Spaceport’s S5B preparation hall, readying the SSL-built satellite for its upcoming integration on Ariane 5. A milestone payload on Arianespace’s upcoming Ariane 5 mission has been fueled at the Spaceport in French Guiana, readying the Indonesian BRIsat spacecraft for integration with its heavy-lift launcher. BRIsat will be operated by PT. Bank Rakyat Indonesia (Persero) Tbk. (BRI), which is one of the world’s first banks to purchase its own satellite. Once in orbit, BRIsat will provide enhanced secure banking communications for more than 10,600 operational branches, as well as to some 237,000 electronic channel outlets and nearly 53 million customers across the Indonesian archipelago. The spacecraft was produced by Space Systems Loral (SSL) based on the company’s SSL 1300 satellite platform. BRIsat will be orbited along with Arianespace’s co-passenger on the June 8 mission: EchoStar 18, which also was built by SSL and will be utilized by DISH Network L.L.C. This direct broadcast spacecraft is designed to provide exceptional sparing flexibility for the DISH fleet, and will augment its existing satellite resources while assuring the highest level of ongoing service to DISH customers. Arianespace’s Ariane 5 launch to deploy BRIsat and EchoStar 18 into geostationary transfer orbit is designated Flight VA230 in the company’s numbering system, signifying the 230th mission with an Ariane-series vehicle. It will be Arianespace’s fifth liftoff in 2016, with the overall goal of performing up to 12 flights this year using the heavy-lift Ariane 5, medium-lift Soyuz and lightweight Vega launchers.